A Staged Reading of "Proof"
Monday, May 7, 2018, 7:30 p.m. - 10:00 p.m. Cultural Programs of the National Academy of Sciences and the Shakespeare Theatre Company are pleased to present a staged reading of Proof, the 2001 Pulitzer Prize-Winner for Drama by David Auburn. This poignant drama follows two sisters as they settle affairs following the loss of their father and their search for balance between family connection and mathematical theories. Featuring Craig Wallace, Antoinette Robinson, Joy Jones, and Alex Piper. Stage directions read by Alicia Grace. A discussion about the value of integrating STEM and the arts and humanities in higher education follows the performance with Samantha Wyer Bello, Thomas Rudin, and JD Talasek. The Shakespeare Theatre Company is handling ticketing for this free event. Register via the link above or by calling the Box Office at (202) 547-1122. If the event is sold out, there will be a standby line starting at 6:30 p.m. All unclaimed seats will be released at 7:15 p.m. to those on standby. PROOF is presented by special arrangement with Dramatists Play Service, Inc. New York. 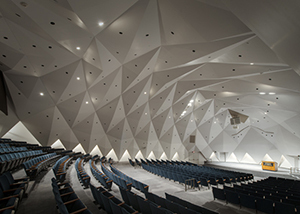 Photo of the Fred Kavli Auditorium at the National Academy of Sciences (c) 2012 Maxwell MacKenzie.